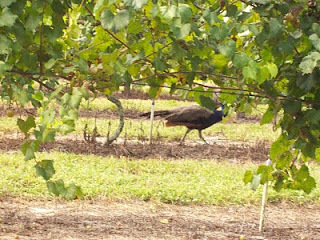 A peacock parades past a row of scuppernong grapes at Tommy Free's Lake Apshawa you-pick grape farm in Clermont. August is harvest month for grapes. On my office wall is a chart I made in 1998. It's an "at a glance" list, showing which month I can expect to harvest local fruits. On countless occasions I've looked up from writing projects to gaze wistfully at the chart, anticipating this or that delicacy in the weeks ahead. A quick look the other day reminded me that August is harvest month for grapes. It's almost time to take a break from work and drive over to Tommy Free's farm on the shores of Lake Apshawa in Clermont to gather a couple bucketfuls of his wonderful scuppernong grapes. As the crow flies, Tommy's vineyard is less than two miles from my home. By roads it's a little farther, but I don't mind the drive. Getting there is almost as much fun as picking and eating the sweet grapes themselves. It's an excuse to travel over a series of scenic, two-lane byways. On the way there, I'm bound to see cattle grazing in grassy fields and horses roaming in fenced pastures. 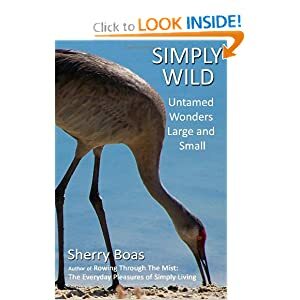 Wildlife abounds in Tommy's still-rural neighborhood. When I'm driving down West Apshawa Road, I often see sandhill cranes or ospreys flying overhead. 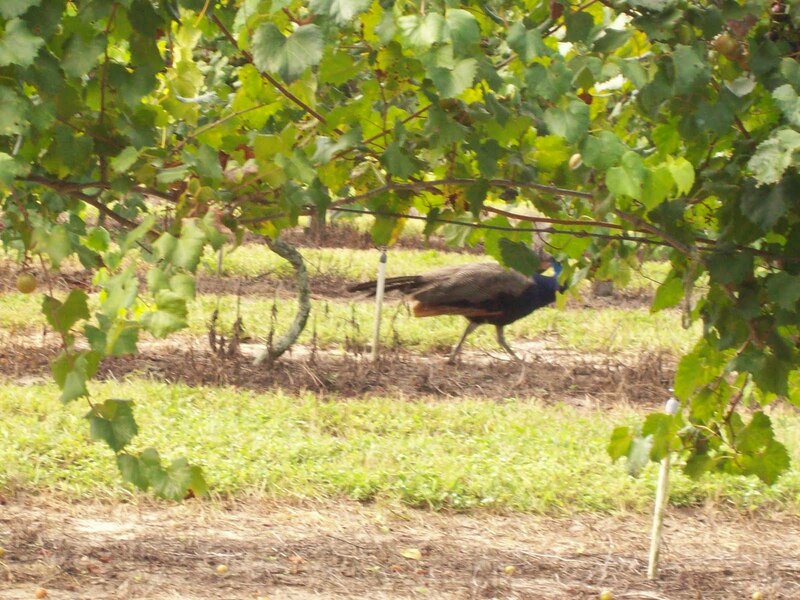 One time when I was picking grapes, I even had some fancy feathered company. A pair of colorful peacocks paraded up and down the row next to mine! The grapes Tommy grows are so special that I can understand why peacocks, opossums, foxes and other animals are attracted to his farm. What I can't quite understand is why more people aren't also enjoying the pleasure of fresh-picked, locally grown fruit. Grapes are one of the easiest crops to harvest. Unlike blackberries, they don't have thorns. They're not low-growing like strawberries, so there's no bending over. 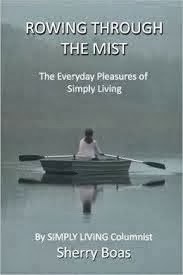 And you don't have to struggle to reach high, as is often the case with peaches or oranges. The grapes at Tommy's vineyard grow at eye level along wires stretched between poles. To harvest fruit, all you have to do is walk down a row, lift a few leaves and pluck the grapes off the vine. Before you know it, your bucket is full. Scuppernongs are a large, round seeded variety of muscadine grapes that are either dark purple or amber-gold. I'm partial to the amber-skin varieties. When I go to Tommy's, I fill my bucket almost exclusively with those. Scuppernong grapes make delicious jelly, a flavorful juice and wonderful wine, but I'm too lazy to spend time creating such concoctions. I'm perfectly content eating the fresh fruit by the bowlful, one grape at a time, until my belly rebels. "You did it again" is Ralph's usual response when I complain that I might have eaten a few grapes too many. "Won't you ever learn not to eat so much at once?" Probably not. There are worse things in life than being a grape glutton. Tommy's opens to the public Saturday, and I plan to be there filling a pail. When I leave, there's no doubt I'll be popping grapes into my mouth as I drive home along lazy back roads. There's also no doubt that I'll continue enjoying them when I'm back at the house, and I probably won't stop until, once again, my stomach insists that I step away from the fruit bowl. Some people get excited about soccer, the latest blockbuster movie, new shoes or shopping excursions. 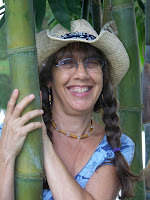 Me, I get goofy over locally grown fruit. Scuppernong season is almost here and for that, I will always be grapeful. Tommy Free's you-pick grape farm is at 18030 W. Apshawa Road, Clermont. For picking times and prices call 352-394-3313. There are indeed worse things in life than being a grape glutton! I've been known to finish a whole basket in about 15 minutes.